Home » Blog » Allergy Patch Testing – Do You Need It? Allergy Patch Testing – Do You Need It? Have you ever put on bacitracin, only to have the injured area get more swollen and irritated? Or maybe you’ve put in your favorite pair of earrings, only to have your earlobes swell up around the posts a few hours later. People often turn to patch tests because skin prick tests and intradermal tests haven’t narrowed down the cause of their allergies. Patch testing also offers the unique advantage of helping diagnose delayed allergic reactions. Allergy patch tests are used to diagnose allergic contact dermatitis, also called allergic eczema. People with allergic contact dermatitis will experience redness, itchiness, flakiness, bumpiness, blistering or thickening of the skin when they physically come in contact with an allergen. While most people develop a rash at the site of contact, the rash and itch may also spread to other parts of the body. This is because allergic contact dermatitis is an immune system overreaction, just like any other allergy. Allergic contact dermatitis is particularly difficult to diagnose because you will not have a reaction the first time you touch the offending substance, as your body in not yet sensitized to it. You can also develop this kind of allergy at any point in your life, even if you’ve made contact with the allergen a million times before. A few different conditions may be confused with allergic contact dermatitis. Patch tests help your allergist narrow down which condition you have. Atopic dermatitis/eczema is a lifelong condition that is typically inherited. People with this condition may experience skin flare-ups that happen without rhyme or reason. This irritation comes from within the body itself and is not a response to any external substance. Irritant contact dermatitis/eczema produces symptoms nearly identical to those of allergic contact dermatitis. In these cases, the substance responsible is not a true allergen because it only causes a localized response and would affect nearly everyone the same way. For example, water is a common irritant that may cause a rash if you swim or wash your hands frequently. Urticaria, also known as hives, is diagnosed when the skin raises in puffy red welts. Contact urticaria may occur after touching a certain substance, but it will crop up and resolve itself much more quickly than contact dermatitis. A person may have chronic urticaria if they react for more than six weeks when they come into contact with the allergen or experience recurrences throughout their lifetime. Hives can also be a precursor to anaphylaxis. Before you start your patch test, you will need to avoid any medicines that may interfere with getting an accurate reading of allergic reaction symptoms. These typically include antihistamines, some antidepressants, some heartburn medications and herbal supplements. Your allergist should give you a list of medications to avoid during your consultation, but you can always double check by calling the doctor’s office if you are unsure. Allergy patch testing takes place over the course of three or four appointments. At your first appointment, you will go over your medical history with your allergist. It is helpful to bring a list of your symptoms and any suspected allergens to this meeting, so they can test for additional substances beyond the normal culprits. Your allergist will then place 20 or more square- or circle-shaped patches on your upper back. Each patch contains an allergen known to cause allergic contact dermatitis. Your doctor may draw gridlines on your skin with a black marker to measure the extent of each reaction. 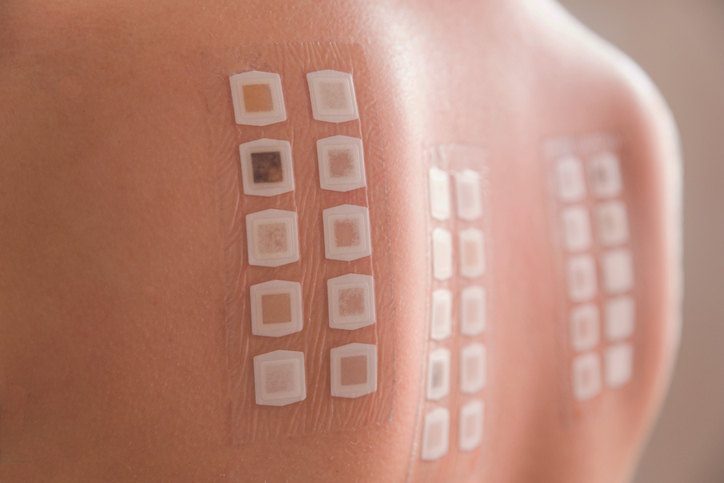 The patches are then affixed to your back with large rectangular pieces of hypoallergenic tape so they stay in place. Your second appointment will typically be 48 hours after the initial application. Your allergist will remove the tape from your back and lift the patches to check for any reactions underneath. As you wait for your appointment, you must take great care not to disrupt the patches or tape on your back. Avoid contact with water, including bathing, showering or swimming, as well as sweating due to exercise or going outside on hot days. If your patches move from their original position, it will be impossible for the test to provide conclusive results. Your third appointment is usually 72 to 96 hours after the initial application of the patches. This appointment is meant to check for delayed reactions to substances. Your allergist may even suggest one last appointment a week after the initial application to verify your results. If your patch test comes back positive, the best way to ease allergic contact dermatitis is to avoid the offending substance during your daily life. This may mean switching beauty products or shampoos, giving up products with certain additives in them or having a conversation with your boss about reducing exposure to the allergen at work. It will likely take a few weeks for your allergic reaction to totally subside. In the meantime, topical steroids may ease symptoms of itchiness and redness. Be sure not to overuse them, as they have side effects if applied for long periods of time. Your allergist may also recommend a moisturizer to help soften and heal scaly skin. You do not have to live with the redness and discomfort of skin irritation forever. If you don’t know what’s causing your skin reaction, it may be time to get it tested and start the treatment you need. At Allergy & ENT Associates, our specialists are certified by the American Board of Allergy and Immunology (ABAI) and will with work with you to identify possible allergens and construct a treatment plan so you can get relief. We offer allergy patch tests and scratch tests to identify the allergens you need to treat or avoid. Call us at (713) MY-SINUS today to schedule your first appointment.